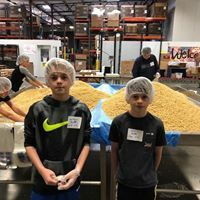 Volunteer activity: Help sort and pack food staples food at the warehouse in Kent. Minimum age is 9. Under age 9 will be turned away. Permission slip required for those under 18 with no parent present. Must wear close toed shoes and shirts with sleeves. Don't Forget: Print and fill out permission slip below. Northwest Harvest is Washington's own statewide hunger relief agency. Our mission is leading the fight for hungry people statewide to have access to nutritious food while respecting their dignity and promoting good health. Our vision is ending hunger in Washington.